Will Venezuelan Parliamentary Elections End the Deadlock? The crisis in Venezuela grows more complex with each passing day. At first, President Nicolas Maduro declared that he was willing to consider the possibility of early parliamentary elections. But it is clear that this proposal is absolutely unacceptable for the opposition, which already wields a majority in the legislature and has the US firmly behind it. The opposition is urging the President to resign and takes a dim view of an early presidential election, no matter how rapidly it can be organized. The “interim president” appointed by parliament, Juan Guaido, is counting on the West’s financial and political support. He is feeling increasingly confident now that the US has frozen Venezuela’s government bank accounts and announced that the pretender president would be given control of them. This means that the government will immediately lose $7 billion deposited in US banks and another $11 billion in expected revenues from 2019 oil sales. Given that, Guaido, dizzy as he is with what he sees as his success, is unlikely to be willing to agree to serious talks or compromises, although he can suggest holding simultaneous presidential and parliamentary elections. Maduro, for his part, is not going to surrender and has already issued a warning that the growing confrontation and the mounting Western interference in his country’s internal affairs could lead to a civil war. There are a number of reasons why the current crisis in Venezuela is of such great interest and may have far-reaching political consequences. The US has always regarded Latin America as its backyard where it is free to lay down the law and punish disobedient. The 1823 Monroe Doctrine, in effect, introduced a “limited sovereignty” model that became increasingly pertinent during the Cold War. Objectively speaking, it is quite easy to understand the US geopolitical logic: Latin America is its “kitchen garden,” a strategically important region close to US borders. The United States has made huge investments in Latin American economies; Latin elites have been educated in the US for generations; the Americans have trained Latin militaries and supplied them with arms for centuries. The region is highly dependent on the US technologically. Besides, Venezuela is one of America’s main oil suppliers. 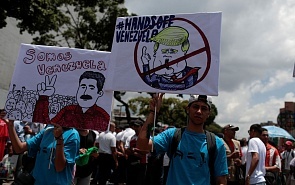 The Americans are exasperated not only by the demonstrative independence of Venezuelan foreign policy but also by the 20 years of leftist reforms under the Chavez and Maduro governments. The same is true of the increasingly noticeable political, economic and military presence of Russia and China in the country. Of no small importance, too, is Venezuela’s good relationship with Cuba. After the Cold War, the Americans initially decided to at least formally follow the rules and refrain from toppling democratically elected governments in the region. Instead they used other, more flexible methods to influence the situation in individual Latin American countries. The exceptions were the abortive coup attempts in Honduras in 2009 and Venezuela (against Chavez) in 2002. From this point of view, the attempt to displace Maduro is relatively out of step with the new US policy in the region and may signal yet another revision of regional strategy. One more specific feature of the current situation in Venezuela is that the US line consists of an eclectic array of approaches that the US has used in a number of Latin American countries over the last 60 years. The contras’ failed landing in the Bay of Pigs in 1961 is one notorious example. A more obscure aspect of the story is how the CIA thought about the operation. After all, no one expected that the team in question would be able to launch a large-scale operation and fight Fidel Castro’s government. The plan was for them to dig in on a limited territory, proclaim an alternative government that would be immediately recognized by Washington, and request US troops be sent in to “support the legitimate government.” The gambit was a scandalous failure, but the “alternative government” idea is still alive and being used in Caracas in the form of a constitutional coup. Another precedent was set in Chile in 1973. Older people remember well the TV footage of well-fed and clearly not overworked housewives banging pots and pans at protests in Santiago and shouting that they were starving. The same tactics are being used today. The US has introduced economic sanctions and is intentionally destabilizing the economic situation in a country that has already been weakened by the government’s experiments with “Bolivarian socialism” to accuse Maduro of being an ineffective leader and to arouse popular disaffection. (But even today, Maduro’s opponents are failing to turn the lower strata that form the majority in that developing country against him: these people remember that it was Chavez and Maduro after him who gave them access to education and healthcare and enabled them to enjoy far better living standards). A third model still in the works is based on the 1989 Panama operation. If the first two options don’t work, outbursts of violence will be provoked through assassination attempts against opposition leaders or assaults on US nationals. This would lay the groundwork for a US invasion under the pretext of restoring law and order and guaranteeing the safety of US citizens. The first two models have been tested in Venezuela, without much success. The question is whether the third option will be attempted. This also raises two more interesting questions. Latin American coups usually become possible if military leaders turn on the government, but in Venezuela they continue to support Maduro. Moreover, it was the military who saved Hugo Chavez in 2002 and thwarted the coup masterminded from outside the country. The question is whether this support endures and whether the US succeeds in offering military leaders enough “carrots” for them to change their outlook. The second question concerns the US president. Donald Trump took over two years ago with his coterie of right-wing political reformers determined to fundamentally alter both America's domestic and foreign policy. In the foreign policy arena, this new approach was based on renouncing interventionism, shifting emphasis towards domestic growth, acknowledging that the center of the world system was migrating from the northern Atlantic Ocean to the Pacific, and recognizing China as the major geopolitical threat to the United States. The last point implies that the US must create a new system aimed at containing China, which, in turn, requires better relations with Russia as a counterweight to China, the start of tariff wars against the PRC, and the destabilization of the WTO and the free trade system as a whole, which allegedly are more beneficial for China than for the United States. But, seen by the US elite (and not without reason) as a systemic threat, Trump is under continuous attack and unable to implement many of these ideas (with the greatest obstacles put in the way of his attempts to improve US-Russia relations). Gradually, the majority of the right-wing reformers left his administration (the biggest loss was the departure of Steve Bannon and Sebastian Gorka) to be replaced by traditional neocons and interventionists like John Bolton, the current national security advisor. Along with the loss of Republican control of the House of Representatives in November 2018, the approach of the presidential primaries, growing stock market volatility, relatively low presidential approval ratings, and unending attacks on Trump from the political establishment and the “elite” press, this is strengthening the hand of those who are urging the president to stage a “small victorious war” of his own. After all, Trump is still the only US president in two generations who has not yet launched a single new military intervention. Meanwhile, Trump himself is between a rock and a hard place, as he is being pressured by both the traditional US right, who dream of the US flexing its military might and toppling the disobedient regime, and the Democrats, who hope to force the president to break his election promises, mire him in a protracted military conflict and thus discredit and politically weaken him ahead of his re-election campaign. The current situation has yet another, broader international dimension. The international community is divided over Venezuela. The United States is supported by Canada, Brazil, and many European and Latin American countries. But that is a far cry from unity. Many right-wing governments in Europe, including Italy, whose government is very close to Trump ideologically, have been skeptical of attempts to give Venezuela away to a different suitor. An even more important factor is that the new leftist president of Mexico, Andres Manuel Lopez Obrador, is well aware of the possibility that Mexico will be the next target, if a constitutional coup is allowed to happen in Venezuela. Moreover, opposing Trump is a win-win for any Mexican politician amid the growing US-Mexican friction over immigration, tariffs, and much else. President Erdogan in Turkey is thinking along the same lines. Most important, of course, is the stance taken by Russia and China. Both have actively cooperated with Venezuela in recent years, with Chinese investment in the Venezuelan economy exceeding Russia’s by almost 400 percent. Nevertheless, China is very cautious about its moves, as it is currently under pressure from the US and unwilling to furnish Trump with another pretext to accuse it of growing expansionism. Therefore, although China could easily compensate Venezuela for the loss of the US oil market, it is unlikely to take demonstrative steps that could aggravate China-US relations. This is why the initiative in supporting President Maduro will most likely remain in Russian hands. Though inferior to China in terms of investment, Russia is the main arms supplier to Venezuela (with sales totaling $12 billion). Russia has also invested heavily in Venezuela’s oil industry and a number of other sectors. Thus, the current situation includes many unknowns linked to actors’ moves both in Venezuela and the United States, as well as Russia, China and a number of other countries. As such, both the course of the conflict and its outcome can be of global importance, influencing, among other things, the prospect of whether the US reverts to its traditional imperial interventionism or opts for a somewhat different policy. The course of this crisis and its outcome may also have serious impact on the domestic political situation in the United States. The potential for a “controlled crisis” looms large in this situation, because the chances of a political provocation aimed at drawing the Trump administration into a military conflict are sufficiently high. Therefore, the dynamics of the Venezuelan drama may decide the fate of both Maduro and Trump himself in the long run.